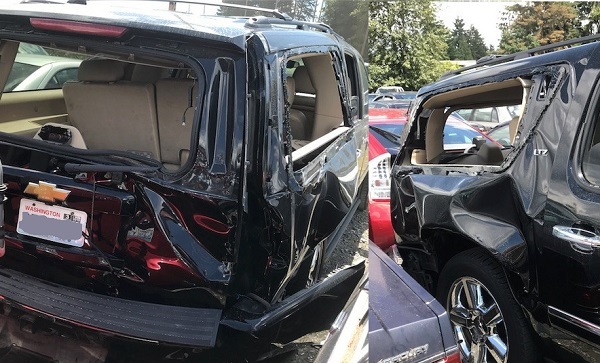 An Uber driver has retained Davis Law Group to represent him in possible legal action related to a Sound Transit bus accident that took place on in May 2018 in Seattle. The Uber driver was transporting two passengers in his black Chevy Suburban in the northbound left lane of Eastlake Avenue. As he approached Thomas Street the driver of a 1999 Pontiac Grand Am failed to yield and turned left in front of him. The Uber driver abruptly stopped and was rear-ended by a Sound Transit bus. The rear and side windows of the Suburban were completely shattered, and the body of the vehicle sustained major damage. The at-fault driver admitted to police that he was waiting to make a left turn onto Eastlake from Thomas but failed to look both ways before executing the turn. The actions of the bus driver are under investigation. The Uber driver was seriously injured. He was transported to Harborview Medical Center for emergency surgery. Over the next few months he will require multiple additional surgeries. He suffered major injuries to his back, neck and head. His back and ribs were broken. He sustained a traumatic brain injury. He required bone grafts, cervical fusion, and more. CALL FOR WITNESSES: Investigators working for Davis Law Group are also looking into the circumstances which caused this collision. Attorney Chris Davis is asking that any persons who saw this incident; who may have come upon the scene after the crash; took photos/video; anyone who may have tried to offer assistance on the scene or who had any contact with any of the victims; or anyone who has any information about the accident to please call Davis Law Group at 206-727-4000. NOTICE TO THE MEDIA: Any and all requests for information or news media interviews must be directed Davis Law Group. Please ask for Mischelle.